Soccer is a team sport that demands not only physical prowess, but intelligence, co­operation, and selflessness. Training to meet the sport’s stringent standards helps develop disciplined individuals who unselfishly support others. 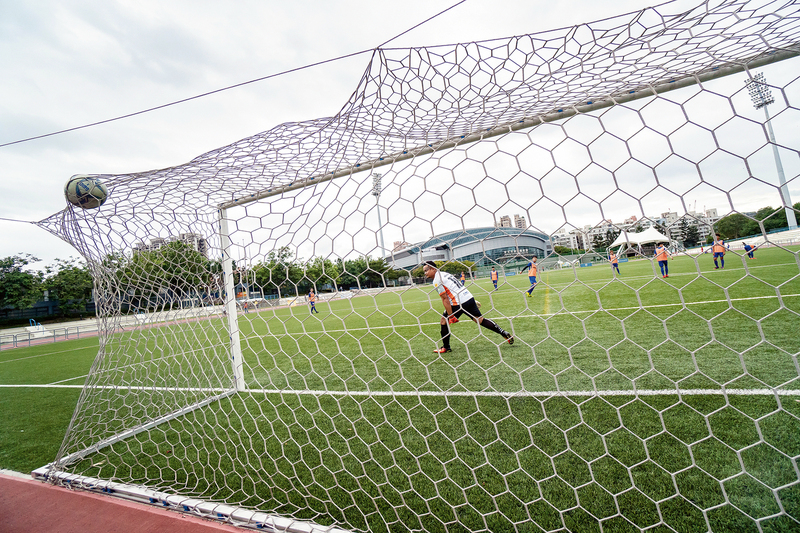 The 2018 Taiwan Cup International Immigrants Soccer Competition featured eight outstanding teams from around Taiwan facing off at the Xin­zhuang Sports Field in New Tai­pei City for the championship. The majority of Taiwan’s more than 700,000 international immigrants view the island as their second home. 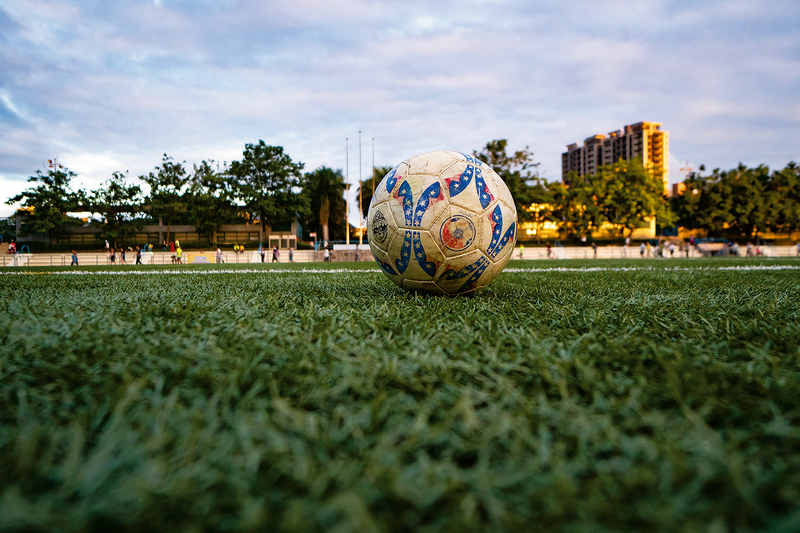 As they integrate into Taiwanese society, they are also introducing favorite sports from their homelands to Taiwan, creating burgeoning popularity for new athletic competitions. 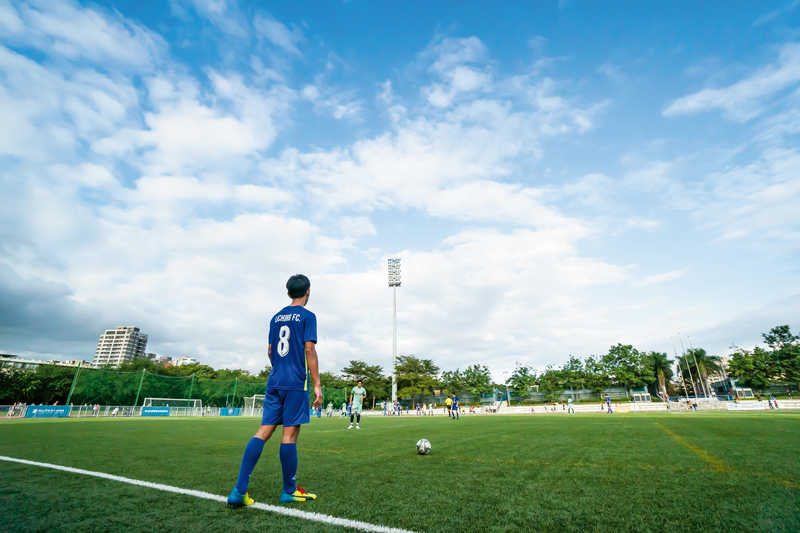 As we look on, teams of workers from abroad compete at New Tai­pei City’s Xin­zhuang Sports Field, seeking to be crowned champions of the Taiwan Cup International Immigrants Soccer Competition. 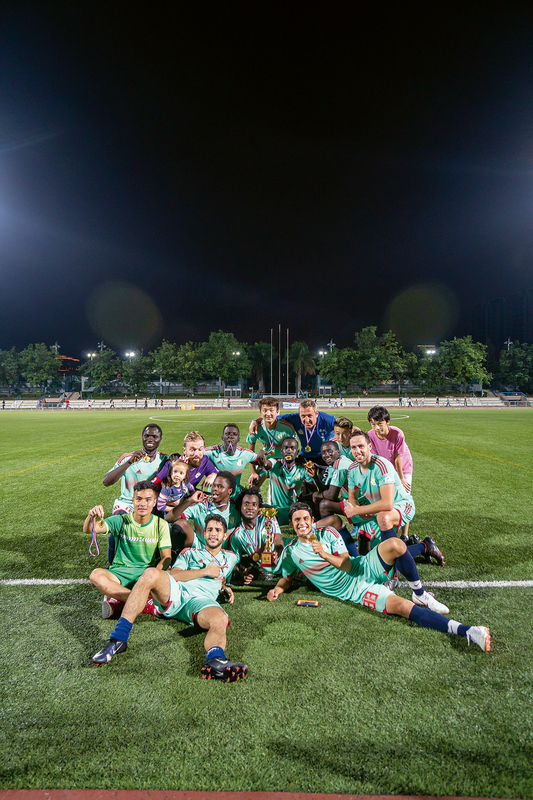 The athletes, a mix of foreign laborers and professionals, pound up and down the length of the soccer pitch’s international-grade artificial turf in their brightly colored uniforms, the sweat pouring off of them. 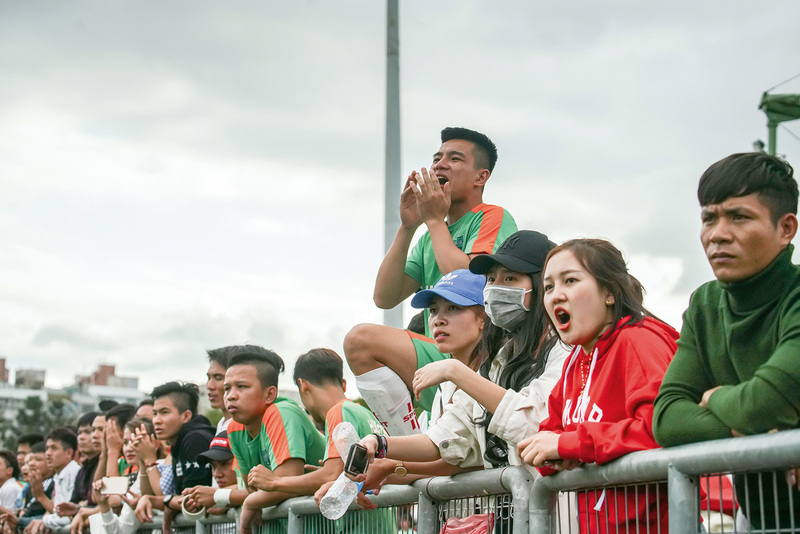 A row of red frame tents lined up outside the bounds of the pitch brims with joy and energy, as the scents of Indonesian, Vietnamese and Thai snacks waft through the air, stirring appetites. The competitors are white- and blue-collar workers of various nationalities, for whom soccer serves as a common language. Friendly rivalries rather than cutthroat competitions, the matches are played in a harmonious atmosphere and with a sense of international fellowship that allows players to appreciate one another’s skills. Choa 37, the 2018 New Tai­pei MWSC champions, took their team name from Nghe An’s vehicle license plates. 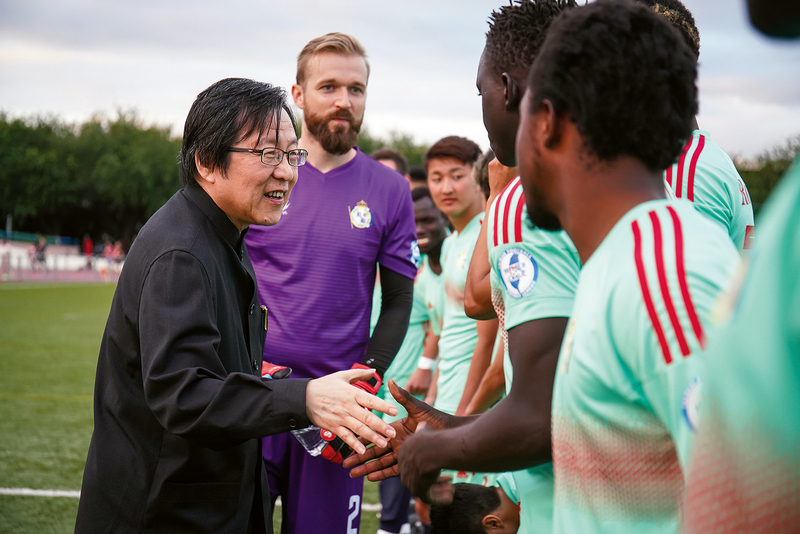 Players confidently state, “We are Nghe An.” Neither tall nor heavily built, the ­seemingly meek appearance of the team’s members hides grit and determina­tion that go bone deep. Their brilliance and team spirit enable them to shine in competition. Founded six years ago with roughly a dozen members, Family No. 1, the 2018 Tai­chung MWSC champions, have since grown to more than 70 players, who reside as far afield as Tai­nan. 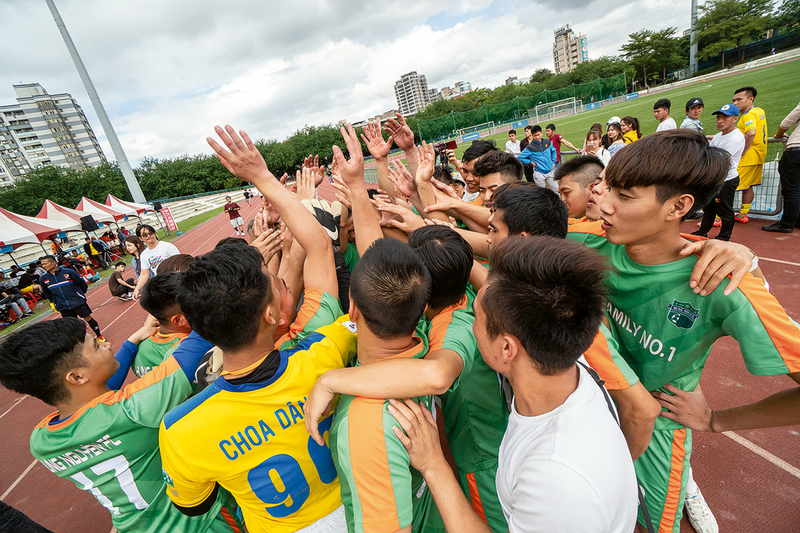 Team captain Ngo Xuan Quy says, “We average about one match per month, and support other teams with which we’re friendly.” The sense of belonging the players feel helps them push the frustrations of living away from home to the back of their minds. Saptono says that his team usually plays one match per month, adding that the most difficult part of arranging them is that many teams lack a set pitch for practices and games. ­Chiou I-jen, president of the Chinese Tai­pei Football Association, explains, “There just aren’t enough pitches. It’s something we need to work on.” The association’s first step has been to establish an exhibi­tion platform aimed at increasing public participation. Part of the league’s role is ensuring that members follow match rules. “Yellow cards result in a NT$300 fine. Red cards cost NT$500.” To accustom everyone to playing by the rules, the fines apply to practices as well as matches. “We also place restrictions on team members’ private lives to help build and maintain a proper team image.” When wearing the team uniform, team members are expected to protect their team’s honor wherever they go. There are Thai teams in northern, central, and southern Taiwan. 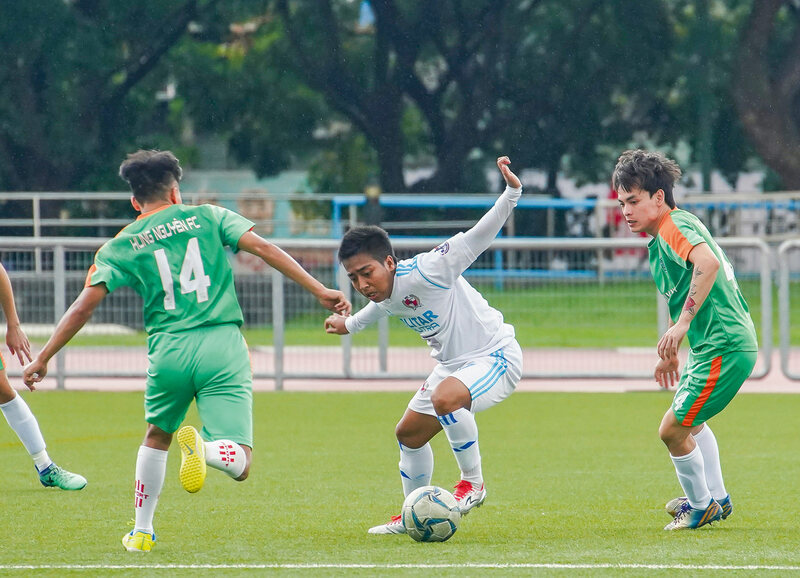 This year’s national competition included two Thai teams: Tafa FC, the 2018 Kao­hsiung Migrant Workers Soccer Competition champion, and Li­ching FC, a club which has existed for 18 years and which finished third in the 2018 New Tai­pei MWSC. Li­ching is grateful and proud to use its employer’s name as the team name. The continuous support of the company’s owner has enabled the team to enjoy its time playing the game without having to worry about other issues. Many members of the Royal Blues FC, the Taiwan Football Premier League’s foreign-players team, and the Tai­pei Athletics FC, which represents the Tai­pei Premier League, came to Taiwan as students. Players for both teams are lively and cheerful, but it is the Royal Blues, known for their regular and diligent practice, who are the favorites to win the 2018 Taiwan Cup. As night falls, the pitch is lit up like a painting and the championship match gets underway. Chiou stands quietly on the sidelines, watching the match intently and wearing his love of the sport on his sleeve. “Soccer is such a wonderful sport. There’s no describing the sense of achievement it delivers. You have to experience it for yourself.” He believes Taiwan’s leagues should adopt international training practices, which give players an opportunity to compete every week. Defensive formations and attacking rhythms both require players to have a feel for one another. Teams succeed when players work together while taking care of their individual ­responsibilities. The farewells conclude with overtures to future gatherings. “We have to get ready for our next match!” No one dwells on who won or lost this time. Instead, they work ceaselessly to improve.